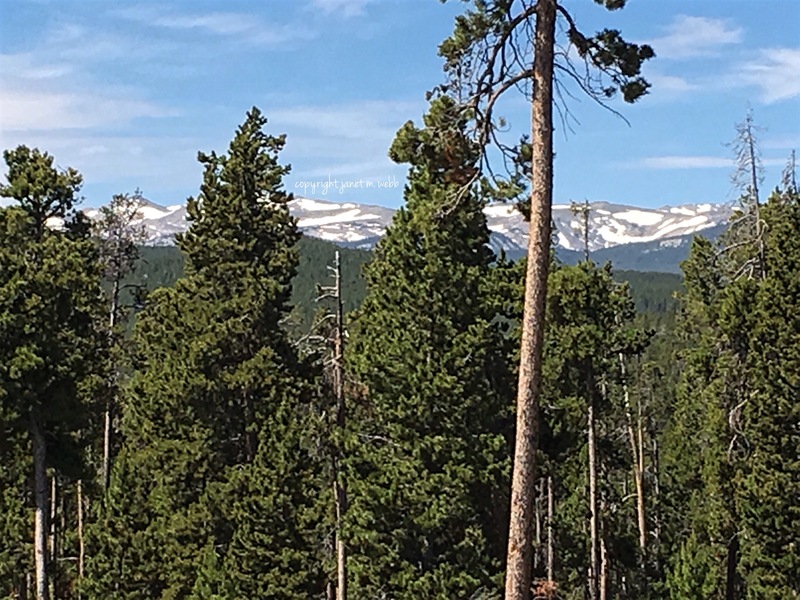 While much of the US was sweltering, in the Big Horn Mountains of Wyoming there was quite a lot of snow on the peaks that top out at just over 13,000′. Several mornings the outdoor temperature was just under 40 degrees Fahrenheit, absolutely lovely for riding. On this day, there was quite a lot of fog, but when I’d ridden for well over an hour, the sun shone and this cool view met my eyes. Taking a photo with a phone while on a horse that’s ready to head home at speed can be a challenge, but I was happy with the result. I’d be happy too Janet. In such beautiful countryside I’d be happy just being there. One of the best things is to sit on the cabin porch and just look and listen. Read, sip some tea. All good. Sounds idyllic — like a holiday should be. That’s a lovely way to see the expanse of Mother Nature on your journey. Oh the mountains! You got a cool ride in the cool air and we got some of your feeling and lovely view. Mmm, that would be a precious gift, Janet! …I remember many years ago, when we left Greenland and went on the plane – I so wished I could take home some of that clean and fresh air. Nowadays I am not that interested in some of the big cities anymore – much because of the pollution. A friend of mine, Jan Alexander, author of AT HOME ON A HORSE IN THE WOODS, just discovered the truth of your statement, “Taking a photo with a phone while on a horse that’s ready to head home at speed can be a challenge”. She wrote a story about it for her sequel. One of those things that wasn’t funny at the time, but …. Pretty snowcapped mountains peeking from behind. Snow would certainly be cooling. I’ve added my entry to my writing blog instead. Hope you enjoy, Janet. I rarely listen to music at home, but I often do in the van. I can now relate to how hard it is to frame up your composition while sitting in the saddle of horse! Oh my gosh it’s not easy with the horse wanting to move to eat sweet grass, or just be moving toward home. Very true. You can get lots of great places on horseback, but to be sure of a good photo, you might have to get off. 🙂 For this one, I was on foot.